Posted on October 19, 2017 - By Fucosoft | Follow YouTube, Twitter to Get More Information. WhatsApp now is the most popular instant messaging app out there, with more than 1 billion people using it to send billions of messages and photos per day. Given this volume of use, WhatsApp users may often encounter data loss issues. If you’ve ever deleted important WhatsApp chats and media on Android accidentally, find out solutions here. 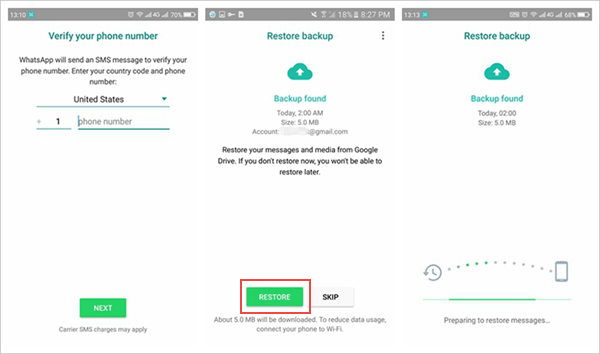 In this article, we’ll introduce how to recover deleted WhatsApp messages from Android with or without backup. To do WhatsApp recovery for Android without backup, you should try third-party recovery software, like Fucosoft Android Data Recovery. With it, you can easily recover deleted WhatsApp chats, as well as text messages, contacts, call logs, photos, videos, music and much more. This program works well on all popular Android devices, including Samsung Galaxy S9/Note 9, HTC U12+, Huawei Mate 20 Pro, Google Pixel 3 XL, LG G7, OnePlus 6T, Sony, Moto, Xiaomi, Oppo, etc. Step 1. Download and run this Android WhatsApp Recovery on computer. Enable USB debugging on your Android phone and connect it to the computer via USB cable. Step 2. Once the Android phone is connected, select files and click “Next” to begin scanning for deleted WhatsApp messages. Step 3. After scan, you can preview all recoverable WhatsApp chats and check those you want, then click “Recover” to restore WhatsApp chat history on Android. WhatsApp now automatically stores chats from the last 7 days, creating backups every day at 2am and saving it on your Android storage. Also, it allows users to backup chats and media to Google Drive. So if you’ve ended up with mistaken deletion, your chats are recoverable. Uninstall then reinstall WhatsApp on your Android phone, and sign into with the same Google account. After verifying the same phone number that was used to created the backup, tap on “Restore” from the prompted message. Rename the backup file you want to restore from “msgstore-YYYY-MM-DD.1.db.crypt12” to “msgstore.db.crypt12”. 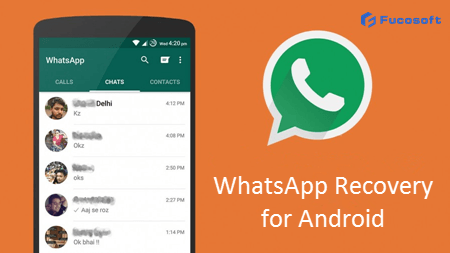 Uninstall and reinstall WhatsApp on your Android phone, then tap “Restore” when asked.